So many people get very upset and angry about current events and the state of the world in general. These days, Capricorn Research tends not to worry, having reached a 2nd Saturn Return, despite having had serious fears about whether the world would survive his first one. The only thing that really gets his goat is other people in his own so called discipline, who make absurd prognostications based solely on a person’s Sun sign. Sun sign astrology has basically brought the whole subject into disrepute. Over simplification doesn’t even begin to describe it, to call it one dimensional would be an undeserving compliment. You don’t agree ? Well ask yourself this simple question. If you could choose the Sun sign of the ruler of the largest country in the world, one that had been a sworn enemy of your own for 40 years and had access to the biggest nuclear arsenal other than your own, which sign would you pick ? Some time ago a journalist wrote an article knocking astrology and the main evidence used was that Margaret Thatcher was a Libra, so how could anyone possibly believe in it. There are no doubt many others who have said the same about Vladimir Putin. Putin has the Sun in peace loving Libra, the sign of diplomacy, cooperation and fairness that most wants to live in harmony with everyone else. What’s not to like. Perhaps its unfair to put all horoscope columnists in the same bucket, some of the more adept ones use Moon signs too. Which is a great relief for the world as Putin has the Moon in friendly Gemini. In truth, Vladimir Putin’s chart makes him about as much of a typical Libra as that of Thatcher and there are a number of things that these two iron leaders have in common. They both have the extremely tough and intense Scorpio rising. They also have very prominent Saturns, Thatcher had it conjunct the Ascendant and Putin conjunct his Sun. But the most worrying thing is the enormous power of Pluto. Thatcher had it in a powerful T Square with Jupiter, Mars and her Sun. 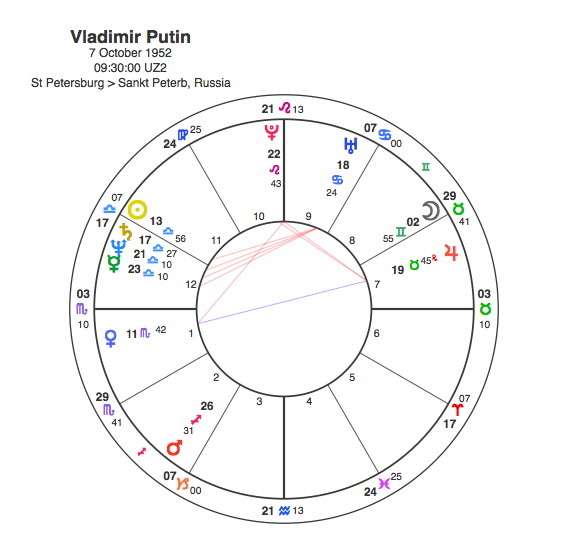 Putin’s is exactly conjunct his midheaven and its also the apex of a T square based on an opposition between his Venus in Scorpio and Jupiter. Some astrologers might feel the Venus / Pluto square is a bit wide at 11 degrees but the involvement of the Midheaven and Jupiter, together with the fact that Venus is in Pluto’s sign, makes this T Square happen. And whilst we might be ok with a Russian leader with the Sun in Libra and Moon in Gemini, we need to be very concerned about one with an apex Pluto lording it over the whole world on the Midheaven. A planet that is at the apex of a T square has a powerful compulsion about it. Whilst the Sun, Moon and Ascendant can give a good insight into a person’s character, the focal planet of a T Square shows where this person has to go in their life. Pluto, as anyone who has read these pages will know is the most explosive, ruthless, domineering and frequently destructive energy. It’s true that the purpose is to sweep the ground clear of all past behaviour in order for a completely new start to occur, and no doubt that is Vladimir Putin’s plan for Ukraine, but perhaps this is one time where Capricorn Research would like foreign affairs to be run on a purely Sun sign basis. Pluto’s dominance in a chart like this would show a powerful dominating political figure but the real threat would inevitably come when the planet was in transit to his Sun. Uranus is square Putin’s Sun an indicator of a radical political viewpoint but also extreme wilfulness as well as a tendency to act suddenly and disruptively. So if a Grand Cross of transiting Pluto, Uranus, Jupiter and Mars occurred somewhere around 13. 56 of the Cardinal signs, the astrological advice for the rest of the world might be to get your tin hats out. And as we all know on April 23rd 2014, this occurred with the 4 heavyweights lined up between 13.34 and 13.50 of Aries, Cancer, Libra and Capricorn. In the month before as they’d all been within orbs but not quite exact, Russian troops had moved into the Crimea. On that very day, Moscow warned that it would retaliate if it judged that the interests of Russian people were being threatened in Ukraine and Russian troops began military exercises close to the border while Nato forces were conducting exercises in Poland. The weeks that followed showed reports of continued tensions along with sanctions being placed on prominent Russians by Western governments. Inevitably the media’s capacity to hold any one story at the forefront of public consciousness waned as it always does but this was all to change after the Full Moon of July 12th occurring at 20 degrees Cancer / Capricorn which was also in hard aspect to Mars, Uranus and Pluto. Within a few days as the Sun closed on its square to Mars, a Malaysian airlines passenger jet was shot down over a part of Ukraine that was occupied by Russian separatists, 298 civilian passengers were killed. Both Barack Obama and David Cameron have called for the EU and the west to change its approach to Russia if Putin does not alter course on Ukraine following the tragedy. This would seem like a perfectly rational and noble response although the fact that it was uttered by someone with the Sun at 15.27 Libra himself might suggest he’s itching for a fight. 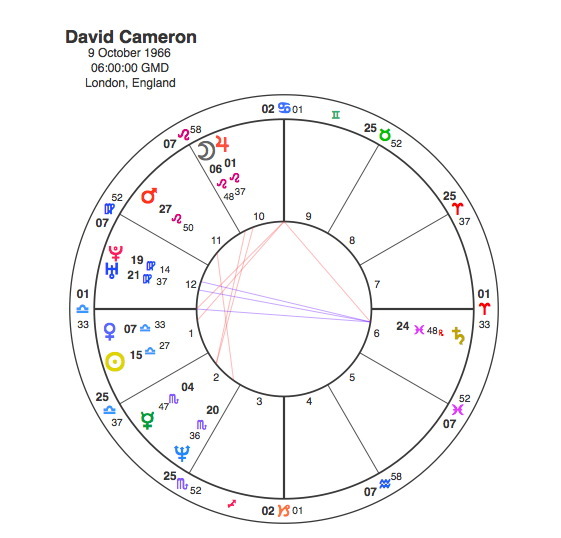 Its more likely that Cameron’s posturing is part of his Jupiter Return which is occurring at the moment conjunct his Moon in Leo in the 10th house. Obviously a good time to take advantage of current events to appear statesmanlike, hopefully in time to win the next election. But what next for Putin ? Pluto is retrograde at the moment and moving away from the square to his Sun. Uranus has come to a halt and begins to turn backward on Tuesday 22nd July. This could well mark the beginning of a backward step for Putin as he recognises the situation has got out of hand. The expectation would be that Russia starts to create some distance between themselves and the separatists. The fact that Saturn starts to go direct after being retrograde since the Russians moved into Crimea, also suggests a change of tack. Its unlikely to be finished however. At the end of September, Pluto starts to move forward again and Uranus will be exactly opposite Putin’s Sun in the 2nd half of October. Uranus goes direct again just before Xmas and renews the opposition in February 2015. But for the whole of the 2nd half of 2015, Pluto is square Putin’s Sun. Mars has been in Libra since December 8th 2013 and leaves the sign at the end of this month which has surely got to be some kind of record. With Putin’s Sun, Saturn, Neptune and Mercury in the sign we might be pleased to see the back of it. The red planet is about to make up for its recent tardiness by scooting round the Zodiac at high speed in order to get back to Libra again in the middle of November 2015. So we need to get through to the end of 2015. Who knows what will happen in the meantime ? Although it seems unlikely at the moment, this Pluto transit could well backfire and bring about the end of Vladimir Putin himself. Pluto conjunct Margaret Thatcher’s Sun in 1979 brought her to Downing Street. After a seriously scary and depressing 11 years in power its conjunction with her Ascendant did away with her. Putin has been the Russian leader for 14 years, Pluto was sextile his Sun when he took over in 2000. It seems reasonable to assume that the conjunction should mark the end of him. Lets hope its not the end for the rest of us. Given that we are commemorating the 100th anniversary of the most brutal war in human history which also started as a result of one small act of terrorism in Eastern Europe, can we just make a plea for everyone to take a deep breath and stand back. And just to be on the safe side, don’t allow any other politicians with the Sun in the middle of Libra to make any statements at all. Putin will remodel the United nations and be in control of the new money system once fractional reserve banking completely collapses. Excellent thoughts on Putin’s Pluto. I have seen multiple chart times for him. There are strong arguments for each one, though I don’t personally know how to rectify a chart well enough to choose. Fascinating charts, whichever you choose. Ivanka Trump’s chart is really something too; a tight wedge, with the Moon conjunct both Antares and Lilith. I read now that maybe he was born in 1950 !! Thanks for that gem Gabriella. That would give him Moon conjunct Pluto in Leo at the Midheaven. It must be true. Where did you get that date from ? As of 2014, there are claims that Putin was born in 1950, not in 1952. There are also claims that he was born in Georgia, not in Russia. He had a brother, Albert, who died in infancy, and Victor, born 1930, at 2 y.o. of diphtheria during the siege of Leningrad in 1942.